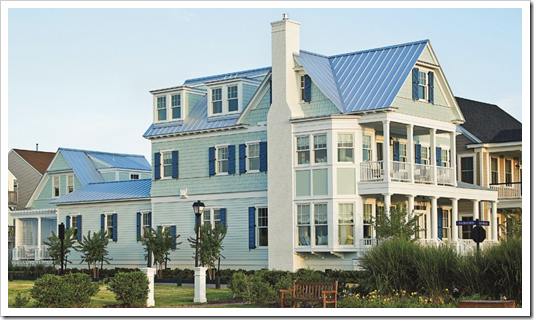 “an elegant twist on the the traditional, coastal vacation home”. 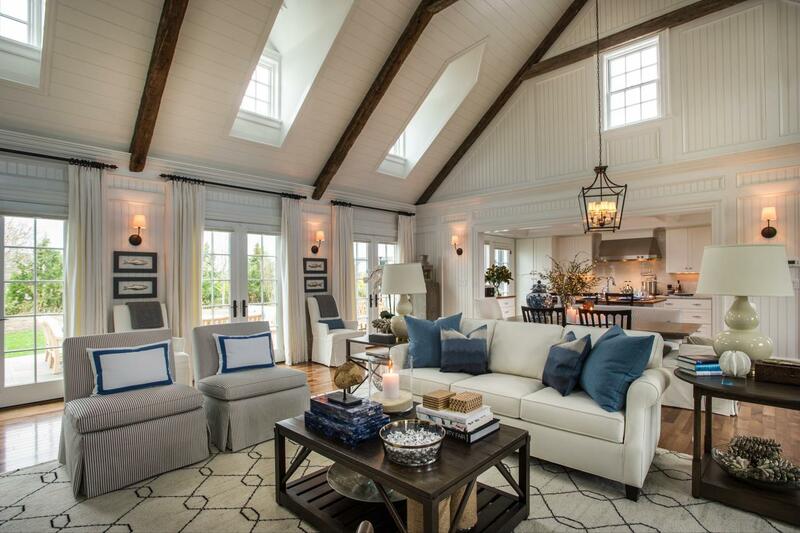 Let’s take a mini tour of this HGTV Coastal Dream Home! 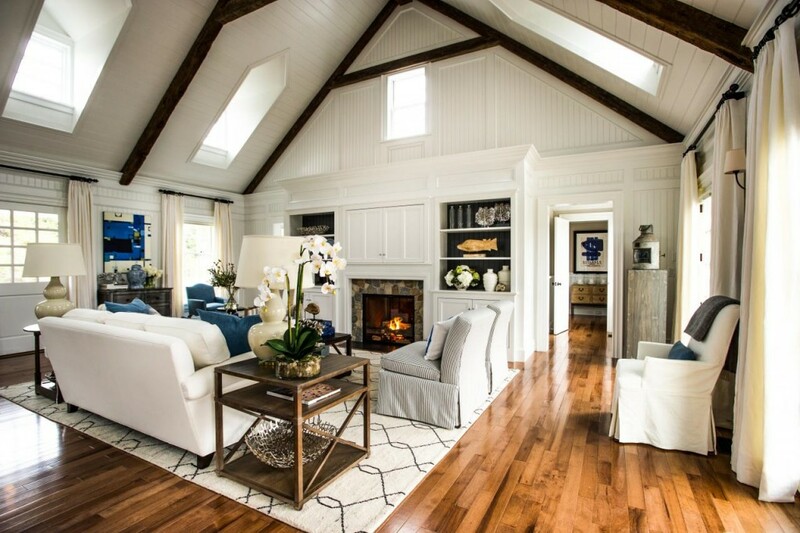 The first stop on the HGTV Dream Home 2015 tour is the great room. The satin white, beadboard walls and paneled ceilings soar two stories high, boasting rustic wood beams and are flooded with natural sunlight galore! The attention the designers took to the architectural details in the wood work and moldings is impressive. 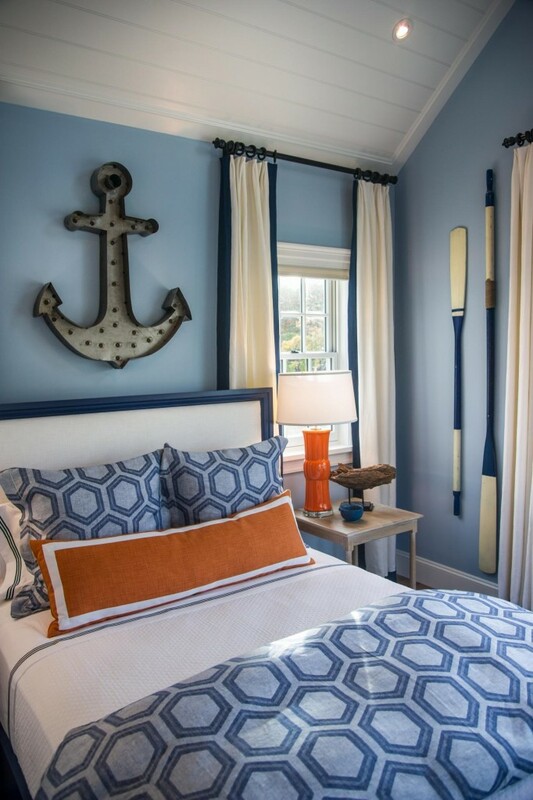 Navy blue accents seen in the built-ins’ back wall paint color, the pillows, upholstery, and decorative accessories, provide a subtle nod to the classic coastal theme. 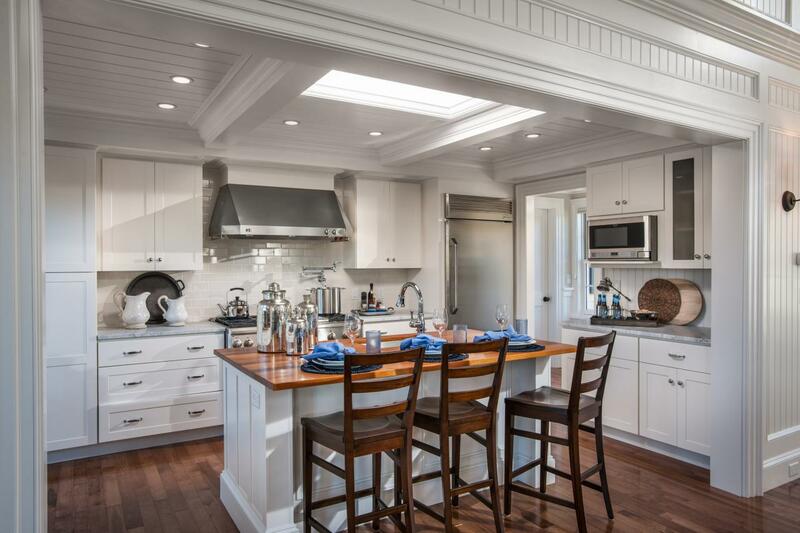 The great room extends though the dining area and open kitchen. The mix of white carrara marble countertops, white cabinets, and white cofferred and paneled ceiling with skylight allow for the kitchen to have a seamless look. 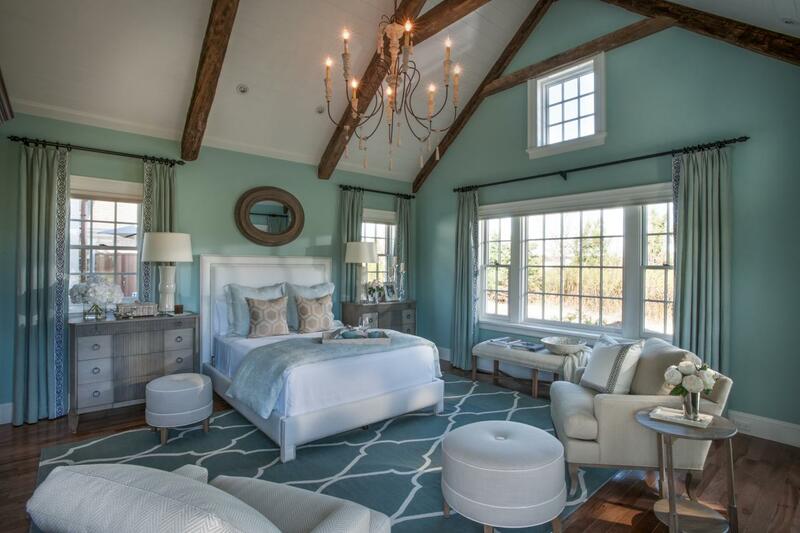 Watery blue walls wash the master bedroom in a feeling of serene tranquility. The oversized iron chandelier and stone fireplace add a touch of romanticism. The mix of soft blues and neutrals paired with driftwood toned woods, modern quatrefoil patterned rug and honeycomb textiles create the ultimate, elegant, coastal bedroom retreat. This master bathroom is fit for a dream home! Just look at the gorgeous barrel ceiling, white mosaic tiled marble floors and counters, mercury glass lighting and posh walk in shower and scuptural soaking tub. SWOON-WORTHY! 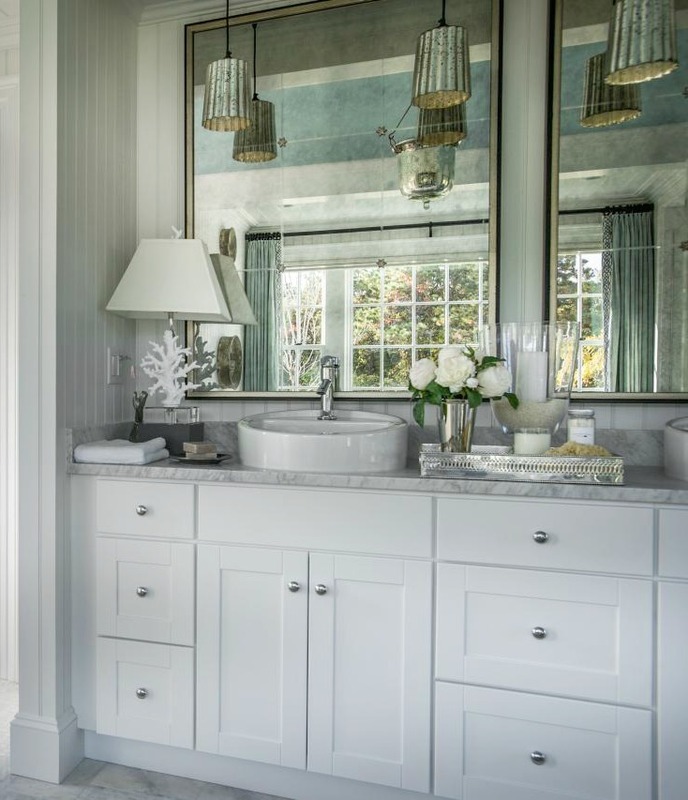 Of course I smiled ear to ear when I saw the pair of coral lamps like mine, flanking the vanity and all the sleek Delta fixtures! Classic navy and white is paired with bright citrus orange for a fresh and modern spin on a nautical color scheme in the guest bedroom. The master bedroom has it’s own outdoor patio, as does the backyard. 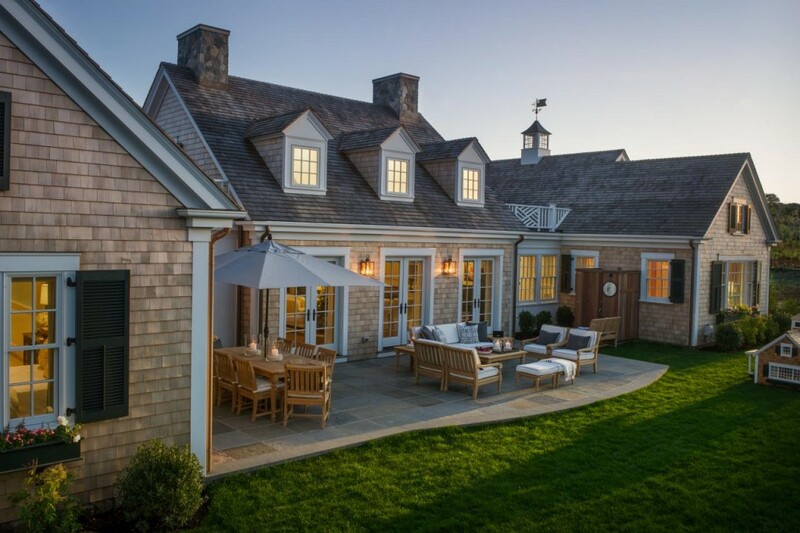 These outdoor spaces are cozy and perfect for entertaining. I must say that this might be my favorite HGTV Dream Home ever! I love how they sucessfully mix the traditional with the modern; driftwood washed oaks and rich toned mahagony with sleek painted (white & gray-blue) wood. This is one home that fits perfectly into the SAND & SISAL STYLE! Don’t you agree? I hope you liked this sneak peek. 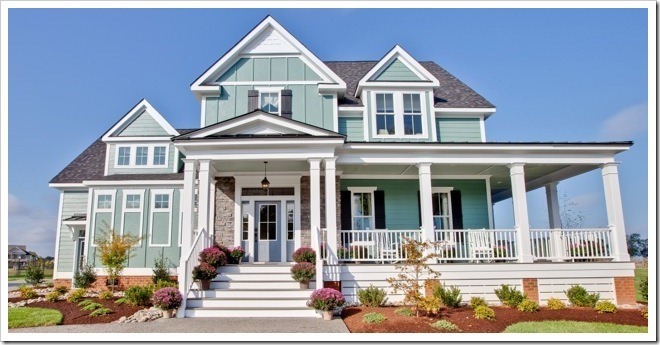 Be sure to check out the hundreds of gorgeous photos and videos of the home HERE. And be sure to watch the premier on HGTV on Jan. 9 at 1 PM EST. Want to win this home? I sure do! Click here to enter the contest! 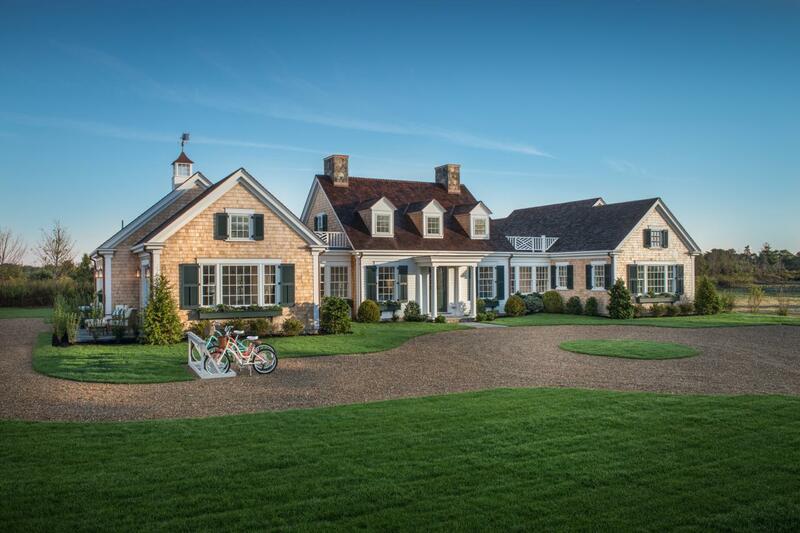 This is such a beautiful house and I’m excited for the lucky person who wins it! I also enjoyed looking back at the Bridgewater house. 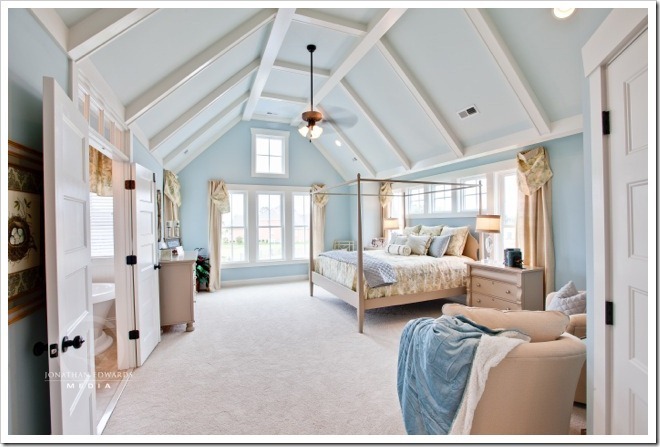 I can’t get enough of the blues, grays and neutrals in a coastal home. It makes the space feel so open. Thanks for sharing Kim! Absolutely gorgeous but I would be afraid to enter and win because I imagine the property taxes are outrageous! Ha! I like your thinking! It is beautiful, but I’ve seen you decorate far better! I stopped looking at HGTV when I discovered your blog! I really had my heart set on the HGTV Dream Home in Park City, Utah, but I also love the location and décor in this beautiful home. I have been entering daily with fingers and crossed toes crossed. Good luck to all of us. Can you tell me the color of paint used in both the master and the master bath? I’m looking to do that same shade. Also the make of the bed?